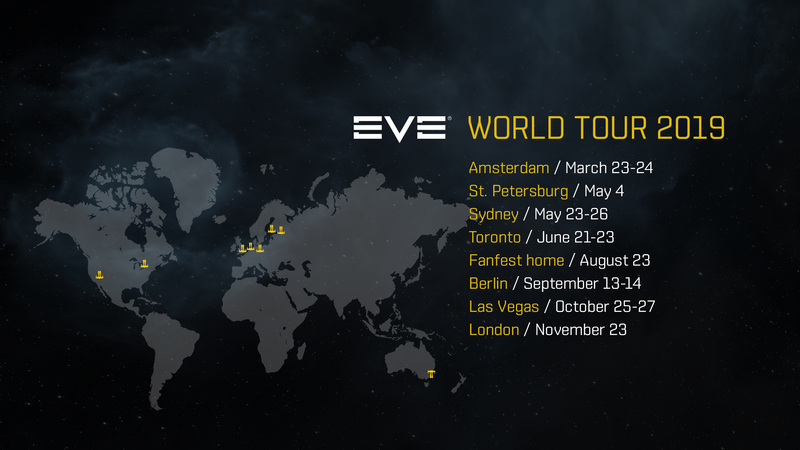 December 20th 2018 - CCP Games, the creators of the in-depth and uniquely player-driven spaceship MMO game, EVE Online, is proud to announce the EVE World Tour, a global series of capsuleer conventions throughout 2019 that will bring a developer-led and player-centric EVE experience to denizens of New Eden across numerous cities and venues around the globe. Working in close partnership with its community, CCP Games will bring an assortment of tournaments, livestreams, unique in-game rewards, reveals, developer roundtables and stellar parties to fans directly, bringing EVE Online closer to its community than ever before as part of the EVE World Tour. View the official announcement reveal here on YouTube. Netherlands: EVEsterdam, Compagnie Theatre - March 23-24 With a keynote presentation, fans will receive a unique look at the universe of EVE Online as told by its developers. Players will make an impact in various ways and you can expect a party worthy of Amsterdam’s nightlife afterwards. Russia / Baltic Region: EVE St. Petersburg, Akakao - May 4 With one of EVE’s most passionate fanbases, EVE St.Petersburg will bring players from around the region together for a day of merriment, amazing developer-led sessions and exclusive content. Australia: EVE Down Under, SMC Centre - May 23-26 Travel to Sydney to experience the unique Aussie community spirit, developer-led sessions, exclusive presentations and Q&As, as well PvP tournament action and Sydney nightlife. Canada: EVE North, Toronto - June 21-23 The first ever official EVE event in Canada will take place in beautiful downtown Toronto. Players will be able to experience PvP tournaments, presentations and party that brings EVE’s signature community. Finland: Fanfest HOME, Kaimonsaari - August 23 A personal, home-sized version of the legendary Fanfest in a player’s living room. Yes, it’s crazy… but that’s nothing new for CCP. Germany: G-fleet Berlin, AltMunze - September 13-14 Taking place in the heartland of PC gaming, exclusive developer-led presentations, PvP tournaments and a huge party await EVE fans in Berlin next September. USA: EVE Vegas, Las Vegas - October 25-27 EVE Vegas has been the official tentpole event for EVE fans in Las Vegas for years, hence needs no introduction. Over one thousand EVE players descend on the city of sin for a few days every year to discuss important spaceship business and party. It breaks attendance records every time and in 2019 it aims to be bigger and crazier than ever. UK: EVE London, Indigo at the 02 Arena - November 23 Held at the world-famous O2 Arena, EVE London brings the classic pub-meet of legend into 2019 and puts it into overdrive. Expect a performance by Permaband and one huge party to cap off an amazing year of EVE Online. About CCP Games CCP is a leading game developer that has been praised for its artistry, game design and unique player-driven, infinitely scalable storytelling narratives. CCP is the creator of the critically acclaimed space MMO EVE Online (PC/Mac), EVE: Valkyrie, a competitive multiplayer first-person spaceship shooter for PCs and PlayStation®4, Sparc™, an original virtual sport for PCs and PlayStation®VR where players’ VR hardware serves as their sports equipment, and the Gunjack™ series, VR arcade-action games for PCs, PlayStation®VR, Google Daydream and the Samsung Gear VR mobile platform. Founded in Reykjavik, Iceland in 1997, with additional offices in London and Shanghai, CCP is an independent subsidiary of Pearl Abyss, the developer of Black Desert Online. For more information, visit www.ccpgames.com.